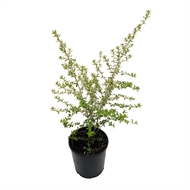 A hardy compact shrub growing 1 - 1.2m x 1 - 1.2m. Small light green leaves with profuse bright yellow star flowers will appear from September to Late November. A great addition to any garden.